Strewn across a dozen or so folding tables are cups of cold coffee and half-eaten lunches. Instead of huddling over drawing boards, though, these emerging entrepreneurs are pecking away on laptops while 3-D printers output prototypes of their ideas. They are hard at work on products and services that may one day change our lives. Project Olympus, now part of CMU’s Center for Innovation and Entrepreneurship, supports faculty and students during the early stages of their entrepreneurial endeavors. One of those students was Derek Lomas, who is a Ph.D. candidate in CMU’s Human-Computer Interaction Institute. Lomas is studying how people learn while playing online educational games. In December 2011, he and Kishan Patel, then a CMU intern scholar, cofounded Playpower Labs, an educational research initiative that develops Web and mobile applications for students in kindergarten through eighth grade. Project Olympus supported their work by providing coaching, connections to experts in their fields, and business advice. “We’re studying how to maximize player learning and engagement in educational games,” says Patel, who holds a B.tech degree in information and communications technology from Dhirubhai Ambani Institute of Information and Communication Technology in India. For two summers, he worked alongside Lomas and Ken Koedinger, one of Lomas’ advisors and a professor in the HCII. Koedinger also is co-director of the Pittsburgh Science of Learning Center. The games—Battleship Numberline, Bubble Pop and Party Time—are self-paced and progress from easy to difficult; they are designed to address concerns about math proficiency and help prepare students for careers in the STEM fields of science, technology, engineering and math. Fraction Planet is available now through a beta Web site (fractionplanet.com) and is scheduled for a full launch soon. “Elementary students have very strong misconceptions about fractions, which makes it difficult for them to learn algebra in high school and go on to pursue STEM education,” says Lomas, who earned a master’s degree in visual arts from University of California at San Diego, and a bachelor’s in cognitive science from Yale University. “Fifty percent of eighth graders can’t order three fractions from least to greatest,” he says, citing a 2004 National Assessment of Education Progress study. The scale at which he conducts his research is also innovative. 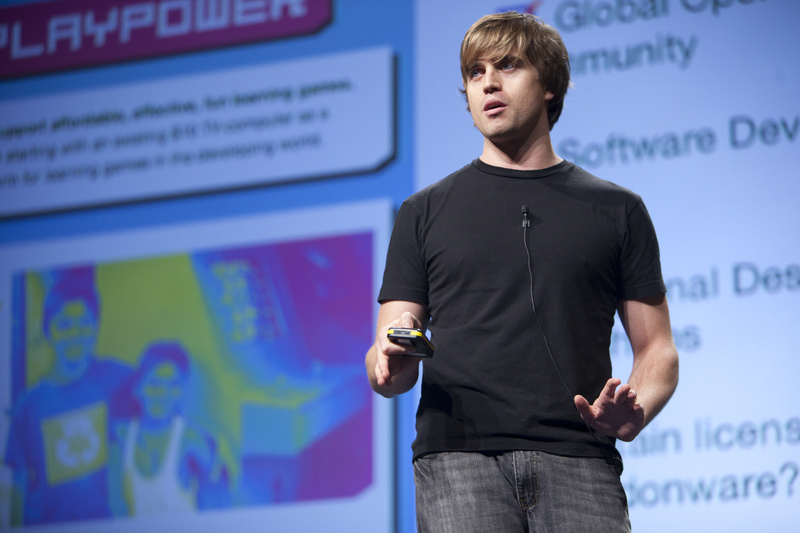 Kit Needham, entrepreneur-in-residence at Project Olympus, says that unlike many makers of educational games, who base their claims on “gut feelings,” Lomas has the data to prove that children do learn using Playpower’s software. Game design is instrumental in the success of Fraction Planet. By adjusting the games’ graphics—the color or size of the battleship, how points are scored, or the frequency of pop-ups with positive messaging—Lomas and his team can analyze how long participants play, at what point in each game they stop and how well they perform. Forlizzi adds that Lomas is deeply devoted to understanding how children learn. “What touches me is that Derek is very committed towards developing high-quality educational games,” she says. “I think he is motivated, in part, by his own two children. He has such a passion for what he is doing.” Lomas is the father of two, Milo, 4, and Mia, 1. Fraction Planet’s success is attracting the attention of others. Playpower has received numerous awards, including the CMU McGinnis Venture Competition award; the National STEM Video Game Challenge award, announced by President Obama and presented by his chief technology officer; and the MacArthur Foundation’s Digital Media and Learning Award. It has received funding from The Grable Foundation, the Pittsburgh Sprout Fund, and a Project Olympus Spark Grant, among others. But it’s being accepted into the TechStars deep-immersion mentorship program that Lomas hopes will propel Fraction Planet into the educational marketplace. Lomas and Patel spent their summer in New York City along with nine other education startups for TechStars, which provides seed funding to companies from more than 75 top venture capital firms and angel investors. Only 1 percent of companies who apply to TechStars are accepted into the program, according to its Web site, and of the 223 startups that have completed it since 2007, 90 percent remain active or have been acquired by other companies. —Linda K. Schmitmeyer is a Butler County, Pa., based freelance writer and editor.